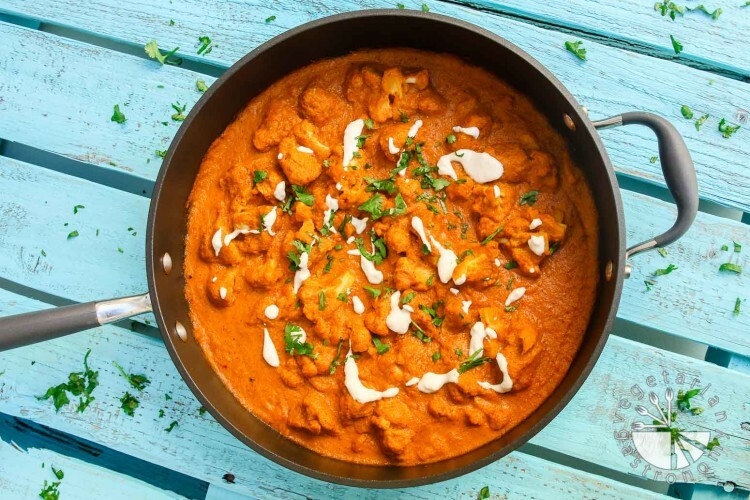 Everyone loves a delicious curry…those bold flavors, the combination of different spices, and that creamy texture. 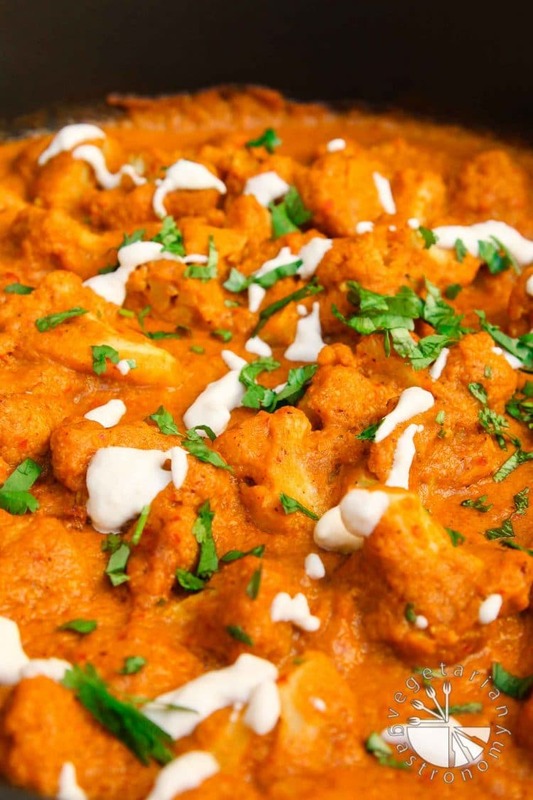 After many trials, today I’m sharing with you my latest creation…Cauliflower Tikka Masala. Some of you may be familiar with this delicious dish. Well, this is my version of it, MUCH healthier, easy to make, and won’t leave you with a stomach ache. Most people who say they love Indian Food are typically referring to Punjabi Food from the Northern part of India. If you’re not familiar with what I’m talking about, it’s all the curries and gravies that are full of spice, very bold in flavor, rich, and creamy. I’ve always been a huge fan of Punjabi food, but to be honest, I rarely like to go out for it these days. Now it’s mainly because most restaurant dishes are not vegan, but even before I went vegan, I found it to be too heavy and I’d always end up with a stomach ache. They have a lot of heavy cream and oil (which to me is unnecessary). So, I needed to recreate another version of this dish at home. Tikka Masala dishes are particular one of the most popular Indian dishes. You may have seen it as Paneer Tikka Masala at restaurants, but I’ve substituted cauliflower for paneer (cheese). I love sauces or curries where you can combine almost everything in a blender, and then let it thicken on the stove. It’s easy, quick, and there is little prep required. After a few trials I came to the perfect combination of vegetables, coconut milk, and some spices to give me that wonderful bold, flavorful, rich, creamy sauce that we all love so much. 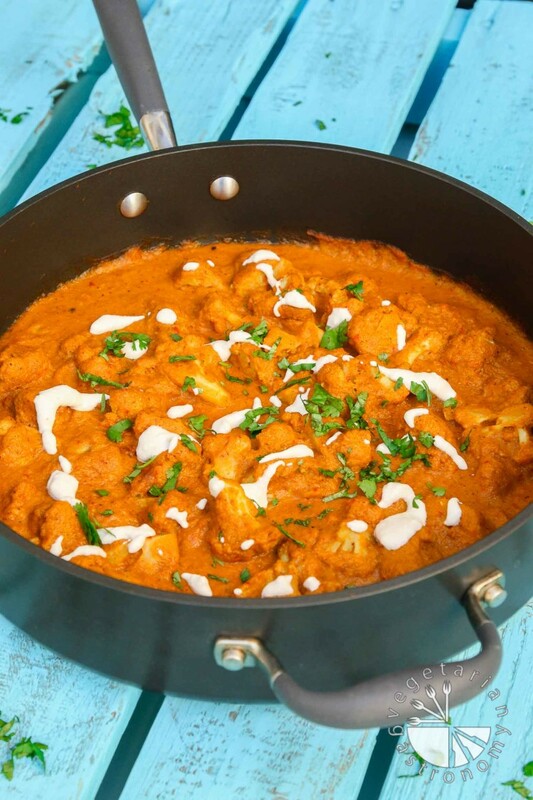 Then simply let it thicken up while the cauliflower cooks in the sauce, garnish with some fresh herbs and you will have delicious Cauliflower Tikka Masala, which is also MUCH healthier. And the best part is that this one won’t leave you with a stomach ache! For this recipe, I achieved a nice level of creaminess without having to use any cashews/nuts, but for a slightly creamier dish, you can drizzle on some cashew cream at the end. For all you Indian Food lovers out there, you MUST try this dish! You will LOVE it! And if you’ve never tried making Indian food at home, this is the perfect dish to start with. It only requires a few spices which should be readily available at most major grocery stores. Try it out and let me know what you think in the comments below! Rich, creamy, flavorful, vegan, and healthy! 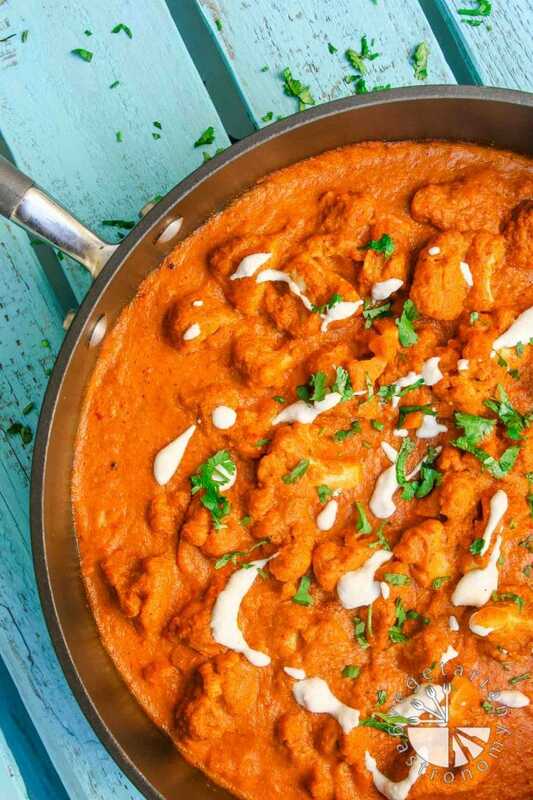 This Cauliflower Tikka Masala recipe is made with whole, clean ingredients! In a large non-stick saute pan, heat 1 tbsp cooking oil on medium heat. Add in the mustard seeds and allow them to fry for ~30 seconds. You should start to see them sizzle and start popping. Immediately add in the finely grated ginger, minced garlic, green jalapenos (if using), and chopped onions. Cook for a few minutes until fragrant and the onions start to become translucent. Mix frequently to avoid burning. While the mixture is cooking, add all the Sauce ingredients above into a blender (I used a powerful blender such as a vitamix, but any blender should work). Once the onions start to become transluscent, turn off the heat, and add all the contents of the saute pan (onion/garlic/ginger) into the blender containing the Sauce ingredients. Pour the sauce from the blender back into the saute pan, add all the Spices listed above, and mix to combine. Heat the sauce on medium-low until you achieve a gentle simmer. Cook uncovered for 10-15 minutes on medium-low heat. If possible, immediately rinse the blender out so you can use it again to make the cashew cream. Add all the cauliflower florets into the sauce, toss, and cook, COVERED, for about 10 minutes on low heat or until the cauliflower florets are cooked and tender yet able to keep shape. Remove the cover and cook again on medium heat, stirring occasionally, for up to about 10-15 minutes OR until the sauce reduces a decent amount and thickens in consistency. While you are waiting, prepare the cashew cream if using. Season with additional salt if needed, turn off the heat, drizzle on 2 tbsp of cashew cream (if using), and garnish with some fresh chopped cilantro. Enjoy hot with some rice, Naan, or favorite tortilla. The sauce itself is very creamy, and although it does not need the cashew cream, I recommend drizzling some on at the end prior to serving for some added richness. To Make Cashew Cream - Combine 1/2 cup soaked raw unsalted cashews + 1/4 cup water into a blender (preferably a high-powered blender). Blend on high until completely pureed. You should end up with smooth cashew cream (i.e. no pieces of cashews should remain). You will only be using 1-2 tbsp of the cashew cream in the recipe above. Store any remainder in the fridge or freeze. For a non-spicy version - Simply omit the red chili powder and green jalapeno. Coconut Milk - You can use lite coconut cream instead of the full-fat version. I've tried this and it still tastes great, just slightly less creamy. Does this have 88888to be made with full-fat coconut milk? Add the fat content from that to the fat content of the cashews and it's waaaaay too much fat for me! Hi there! So if you read the directions and ingredients, you'll notice that the cashews are completely optional. I actually purposefully developed this sauce to be flavorful, bold, and creamy without the addition of any nuts (as I mentioned in the post write-up). So this recipe tastes great without the cashews and you can simply leave them out. Also, if you DO decide to use the cashews, I stated that you will only be using a drizzle (1-2 tbsp) of the cashew cream total as seen in the photographs (the recipe will make excess of cashew cream mainly because it's difficult to make a really tiny amount of cashew cream at one time in a blender). I'll re-word the ingredients so this is more clear.Also as for the coconut milk, yes, you can use lite coconut milk instead, but it will of course be a little less creamy. Hope that helps and let me know if you try out the recipe! It's delicious! This looks amazing! My favorites for Indian dishes are Chana saag and malai kofta. Do you have some versions of those? Thank you!!! Thanks Vicky! I've been making this dish a lot, it's become one of our favorites and so easy to make! I don't have a malai kofta recipe yet, but I make Chana saag all the time at home...will plan on getting it on the blog soon! yea, yea! LOVEEEEE tikki masala!! One of my favorites! Truly this is so easy--I love new cauliflower recipes! Thanks! Thanks Letty! It is VERY easy, light, but very flavorful...you'll love it! I can't wait to make this. 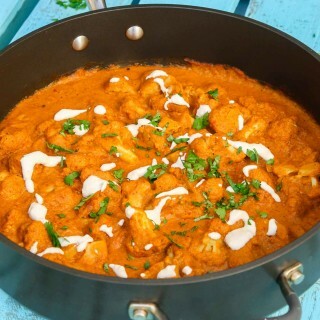 Indian food and cauliflower are 2 of my favorite things to cook! Then you'll love this recipe! If you try it let me know! loving thisssss. i want this for dinner one of these days! Thanks Dixya! You'll love it! Whenever there is cauliflower involved, I'm in. Combine that with curry, and this is a total win! Thanks Laura! This is one of my favorites. I was trying to come up with a curry that was plant-based and healthy! Oh, yes, I would love this! First of all - cauliflower - my fave! And second of all - tikka masala - so delicous! Love that it's a lightened up version. Must try! It's definitely a lightened up version, but so good! I'd love to hear what you think if you give it a try! I've been wanting to make cauliflower tikka masala, so thanks for the added inspiration. It looks wonderful! Thanks Kelly! I've always loved the flavor of tikka masala, but was on a mission to make it vegan and plant-based. This version is light, but full of flavor! I seriously need to make this soon! Gorgeous recipe and photographs. This is my vegan version of it. I wanted to keep it as healthy as possible using whole ingredients without loosing flavor! My family loves it! Let me know if you try it out. Such a rich, thick and delicious looking curry and such lovely flavours in there.The cashew cream would NOT be optional in my house! I love Indian food and have just perfected an Indian style recipe that I have been working on. I can't wait to publish it! My local Indian restaurant makes a wonderful vegan korma with ground cashews and that is my favourite Indian meal. Oh wow...an Indian restaurant that makes a vegan korma?!?! That's awesome! It doesn't typically happen that often. I've always loved north Indian food, but even before I went vegan, it always left me with a huge tummy ache after. I tried to keep this recipe as healthy as possible using whole ingredients without loosing any flavor! And YES to the cashew cream...glad you feel the same way I do. Although it is optional in that the flavors of the curry itself are very bold. That way people can leave it out of they need nut-free =) Can't wait to check out your recipe! Making this today! I am making it ahead of time and reheating though- do you think that will affect it? Awesome! Nope...it shouldn't affect it at all. In fact, I actually like curry more the following day because the flavors have a chance to marinate together for longer =) Let me know how you like it! I wanted to keep it as healthy and clean as possible without loosing any flavor! Oh it's my comfort food also...I've always loved the flavors of north Indian food, but to be honest, before going vegan and eating out at resturants, I'd always come home with a huge stomach ache, so I wanted this dish to have the same bold flavors I love, yet keep the ingredients plant-based, healthy, and made with whole foods! I'd love for you to try out this version and let me know what you think! Malai kofta is a fav of mine also, sounds like a great thing to do with your family! Thank you! Yum! This is one of my favorite recipes! I could all of it by myself! Definitely putting this recipe on my list of recipes I need to make soon! Thanks so much for sharing! Thanks Vanessa! You will love how easy this version is, not to mention it's vegan, healthy, made with whole ingredients and won't leave you with a tummy ache (which is what always used to happen to me). My kids even love it. If you try it out, let me know! Thanks Michelle! You'll love it! 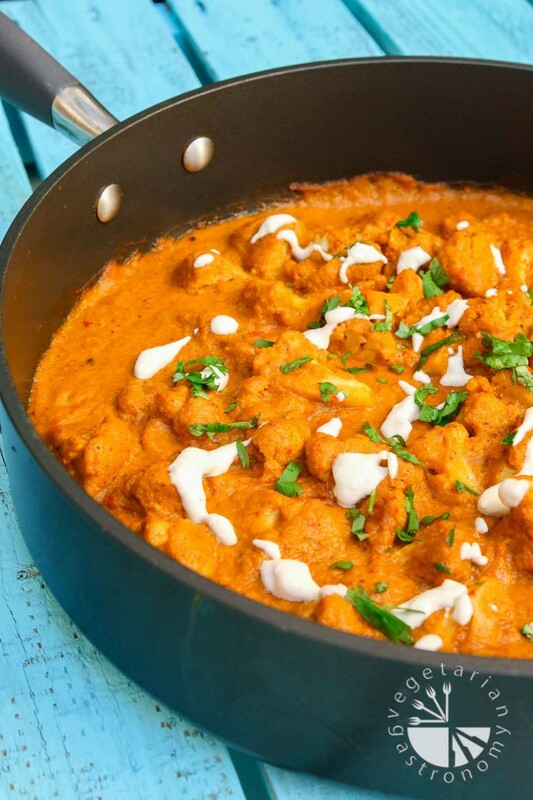 'Tikka Masala' is the magic word at our home especially when they say 'I'm not hungry' ;) The cauliflower tikka masala looks so yumm and love the gorgeous colors. Haha that's awesome!! Well then this recipe is perfect for your family =) It's also much healthier, and made with whole ingredients, and super easy! If you try it out let me know! I've been looking for a great vegan tikka masala recipe, and I think this is it! These spices look just right for my palate. Pinning, and hopefully giving this a go soon! Thanks Gin! I wanted to create a sauce that was of course not only vegan, but flavorful, made with whole foods, and healthy! I also wanted to develop it nut-free since we end up doing a lot of nut-based dishes in our house (especially cashews) it's nice to be able to get that creaminess and flavor other ways. Although as you'll see, I still couldn't resist that cashew cream drizzle on top =) If you try out the recipe let me know! Tried this over the weekend (used Lite Coconut Milk). It was fantastic, even my little one ate it! So happy to have a vegan version of this delicious dish. Oh wow!! Thank you so much for the awesome review! I really tried hard to create this vegan plant-based version that was healthy, and made with veggies. I'm huge on trying to make my recipes work for the kids as well, so knowing that your little one ate it makes me really happy! =) Thank you so much for trying it out and letting me know! I'm allergic to both coconut and cashews, but I would love to try this dish! Any suggestions for substitutes? The cashew cream is completely optional. You can easily omit it and this recipe will still taste great! I ended up choosing to use coconut milk as the base to keep it slightly coconut in flavor and thick. Unfortunately I haven't tried this recipe with any other base other than coconut milk, but other vegan options would be I'd suggest using perhaps a combination of your favorite non-dairy plain yogurt (I like Kite Hill or home-made or so-delicious brand) + non-dairy milk (such as unsweetened almond milk (since you're allergic to cashew milk). However if you try this, you may need to adjust the spices to get the right flavor to come out. Hope that helps a little! When I get a chance next time, I'll try to find an alternate to coconut milk without using cashews. Let me know if you give it a try! I've made this dish several times and it is delicious! I plan on using the gravy to make tofu tikka masala next time. Thanks for a wonderful substitute to the dairy version! Thanks Parinda! After I created the sauce, I was so torn on what to add to it, because as you mentioned really anything works with this sauce! I'm sure tofu would work so well, I've had it in place of paneer in other dishes. Try baking the tofu in the oven sometime...love the texture of it! And so glad you love this dish...I worked hard at keeping it dairy free and healthy! Totally made this last night, and it was amazing!! This dish was easy to make (surprising for an indian dish) and full of flavor. I literally can't wait to eat the leftovers. :) Thanks for the recipe Anjali ! 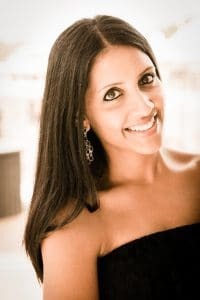 That's so awesome to hear Sonal!! I spent a lot of time developing this recipe making it plant-based, yet flavorful, easy, and HEALTHY mainly! So I'm really glad you loved it, it's been such a huge hit and this recipe has gone viral =) Leftovers will taste even better =) Hopefully you'll see a few more recipes like this in the blog soon! Thanks again! I never comment on these recipe sites, but this recipe was OUTSTANDING! Vegan dishes sometimes leave me unsatisfied but the flavors in this dish are so layered and rich and delicious that I just can't believe it. Even without the cashew cream, it's amazing. Thank you so much! Thank you SO much for the wonderful comment Melanie!! Made my day! What you described is exactly what I was going for in this dish...so glad you loved it!! Im hoping to create a few more similar vegan Indian Curried and dishes that are made with whole ingredients and packed with flavor!! Let me know if you ever want a few of my favs from my site, especially my Thai dishes they will not leave you unsatisfyed. Thank you!! So great to hear! I just made this recipe, and it was phenomenal. Thank you for a flavourful, bright, rich, complex dish! 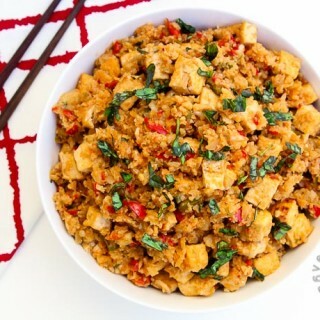 I added 454 grams of cubed tofu and ate it with homemade bread to make it a complete meal, and it was amazing.If I could, I would give this recipe 5 stars! 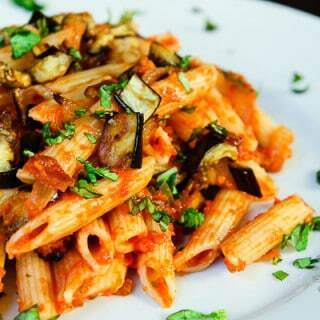 Hi Anjali, this dish looks awesome! I was wondering if the bell pepper can be omitted (due to an allergy) or if that will change the taste. Can't wait to try this! Thank you! Hmm...I've never really tried it without the bell pepper...it definitely ads to the flavor and taste of this dish. I wanted this recipe to be vegan and clean so carefully used the ingredients. That being said, I think you could try subbing it with some carrots instead of the bell pepper. That should wrok, but I'd steam the carrots first. You may get slightly different taste but it should still be tasty. Just keep in mind, i haven't tried it this way before. Give it a go and let me know! Next time i have the chance I'll try it as well! This dish is fantastic! Full of flavour and super easy. Makes heaps as well! The only thing I did differently was add extra coconut milk because it was a bit too thick for me. Will definitely be making this again. Thanks Axyl!! So glad you loved it...full of flavor and plant-based healthy was exactly what i was going for! Thanks for trying it out. Waited until I collected each and every ingredient to try this recipe. Worth every step! Absolutely delicious! Oh my goodness, Anjali -- this was sooooooooooooo good! I made a triple batch serving to a large company of guests last week and everyone loved it. Beautiful flavors and so simple to make. I added some chickpeas to the mix as well, which was lovely.Thank you for the delicious recipe -- I'll be making and recommending it plenty :) Definitely a keeper! Aww thanks so much Audrey!!! So glad you and all your company loved it and enjoyed it! Chickpeas sounds like a great addition, you can really add just about anything to the mix! This past time i actually added uncooked quinoa along with cauliflower to the sauce and it also turned out delicious! Thanks for trying it out and commenting!! Thanks Elyssa! You'll love this recipe then! This dish is actually not that spicy and you can omit it completely if you want. My 7 yr old doesn't do any spice so i omit it for him. You'll both love it! Let me know if you try! This dish is yummy! I recently gave up meat and am experiementing with all kinds of new recipes. Love this! Definitely a keeper! Thanks Rachel! Let me know if you want me to point me to a few other top favorite recipes on my site! Glad you loved it! I made this tonight! It was good but definitely off a bit. I used different types of tomatoes and a yellow bell pepper instead. Also, I only had lite coconut milk. It was still a little gritty and not super smooth. I used a ninja blender. However, it was still really yummy and I attribute the difference to the slightly different ingredients used. Will definitely make this again - next time with the exact ingredients.Thanks for the recipe!! Hi there! What type of tomatoes did you use? If the tomatoes are different, then it'll definitely cause a difference in taste. The yellow bell pepper shouldn't be much of a problem. And the lite coconut milk should've still been fine, just a little less creamier. I've always used my vitamix to ensure a super creamy sauce, but totally a preference thing. I developed this recipe pretty precisely using these ingredients because i wanted to try and get that tikka masala creamy flavor with only clean whole ingredients, so unfortunately I haven't tried very many other variations in ingredients. But yes! This is one of my most popular recipes, so I'm certain it'll taste awesome next time with exact ingredients! Thanks for letting me know! I have always used my vitamix to ensure a super creamy sauce..Thnaks for sharing this post..
Found this recipe on Pinterest and it was great!!! I did as you suggested for a milder version so my 1.5 year old daughter would eat it. I omitted the red pepper and only used half of a jalapeño. Also topped hers with a little extra cashew cream. What a great, filling, family friendly dish!!! I’m a new follower. That's awesome Brenda! Thanks so much for trying it out...glad you loved the recipe and thanks for following! Let me know if you want any other recs! Cauliflower with gravy was good. Excellent recipe! I’ve always loved Tikka Masala so when I went vegan years ago I thought that was the end of it. I tried various vegan versions, but was left disappointed every time. Your recipe, though, is simple and delicious! Thanks for sharing. What an awesome review...thank you so much!! I agree with you completely...I was trying to create a plant-based healthy yet just as delicious and rich!! So glad you loved it! Hoping to have some more vegan favorite indian dishes soon! This recipe is awesome. I made it without the bell pepper and the taste was great and did get mistaken for chicken tikka masala. While the color was not a beautiful red the taste was still great. Highly recommend trying this as it is easy to make! Thanks for the awesome review and so glad you loved it!! Happy it worked out without the bell pepper since I've never tried it that way before!! Would this freeze easily? I was hoping to make it ahead on Sunday to thaw out and serve Friday? Thoughts? I've personally never tried freezing it, but YES...i think it'd freeze great!! Let me know if you try it out! Just made this and it was deee-licious! Our meat-eater daughter wanted to have leftovers for lunch, but there were none. I ended up using the whole can of coconut milk, but made no other adjustments to the recipe. Fabulous sauce, can be used for all kinds of veggies. Oh wow! what an awesome review! Thank you so much...if she was asking for leftovers for lunch, then I know it's a huge hit in your family! This looks delicious! I do like to use things that are a bit heartier and more filling than veggies alone when doing meatless dishes, otherwise my husband complains that he is starving an hour later... How do you think this would be with something like chickpeas or lentils? Yes absolutely! Many people have made this recipe and added in chickpeas or just used chickpeas themselves in place of the cauliflower. You can also do baked or pan-fried crispy tofu. To be honest, this sauce can be paired with almost anything for a delicious dish! let me know how it turns out! This is a wonderful wfpb recipe. I only had to leave out the oil. I used a little water to saute the onion, etc. Thank you! Does the potassium content include the cashews? The 2 tbsp cashew cream is an optional addition, so no it does not. If you are trying to add it in, please keep in mind that you are only using 2 tbsp of the cashew cream made (so not all of the 1/4 cup of cashews). This is a brilliant recipe. What an inspired idea to add cashew milk. Yes I like to make my own cashew milk by soaking raw cashews just like you suggest. For me of course it has to be full fat or heavy coconut cream. More fat helps with weight loss. This would make a perfect Keto diet recipe. This was absolutely delicious. I generously used the cashew cream and it took it to a new level. Thanks for sharing, this will be in my Indian recipe folder to pull out on occasions I want to impress! Thanks so much for trying out the recipe! So glad you loved it! And yes...the cashew cream definitely tips it over! Just made this last night, it was very yummy. I added other vegetables in addition to the cauliflower, which was pretty much my only adjustment. I really enjoyed the flavors, and will definitely keep this recipe. Thank you very much! Awesome to hear!! And yes...you really can add any veggies you want! Thanks for the feedback and glad you loved it! This is awesome... as soon as I have seen this curry's picture... I guess the taste.. but I know, If I need the real taste of this.. I must try this recipe. there is an Indian food called Parata... I assume this is nice with parata... mmmmm.. Anyway, need to try first... :-) Thanks for the delicious recipe..
That's great to hear! And yes...give the recipe a try you'll love it! This curry would go perfectly with paratha!